The Marvel superhero juggernaut powers on with Avengers: Age of Ultron, the penultimate movie in Phase II of the ever-expanding Marvel Cinematic Universe. Writer/director Joss Whedon returns to the fold, following his wonderfully witty and entertaining 2012 smash Avengers Assemble, once again bringing together Tony Stark/Iron Man (Robert Downey Jr.), Thor (Chris Hemsworth), Bruce Banner/Hulk (Mark Ruffalo), Steve Rogers/Captain America (Chris Evans), Black Widow (Scarlett Johansson) and Hawkeye (Jeremy Renner). This time, our heroes must battle villainous A.I. Ultron (voiced by James Spader) whilst also attempting to balance their own internal tensions, ones that will eventually spill over into next year's Phase III curtain raiser Captain America: Civil War. With far too many subplots and characters to handle (other new faces include Elizabeth Olsen's Scarlet Witch, Aaron Taylor-Johnson's Quicksilver and Paul Bettany's The Vision), Age of Ultron is ultimately saved by its good-natured brio and quick-witted sense of humour. Even when the action becomes far too incoherent for its own good, the movie's refusal to take itself too seriously means it's never anything less than solid entertainment. However, there is a distinct sense that the talented Whedon is visibly straining to mesh his own vision with that of the Marvel franchise, and this strain further manifests itself in the soundtrack for the movie, one of the most controversial in recent film music history. Although Alan Silvestri scored the previous movie, this time Brian Tyler landed the gig, himself a veteran of the Marvel films having lent oomph to Iron Man 3 and Thor: The Dark World. However, questions were raised back in March of this year when a certain Danny Elfman was spotted as being credited alongside Tyler on a pre-release poster. 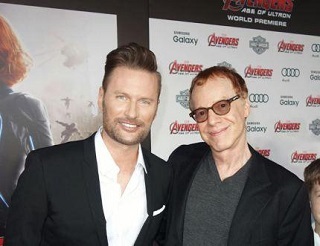 It turned out that Elfman, one of the godfathers of modern superhero scores through the likes of Batman and Spider-Man, had been drafted in as an official co-composer on the movie, subsequently announcing his intent to adapt Silvestri's beefy theme from Avengers Assemble. Just as questions were raised as to why Tyler wasn't asked to do this himself, especially as he'd already promised to reference pre-existing musical themes in the Marvel Cinematic Universe, the mystery deepened. Was this a case of scheduling conflicts on the Tyler-scored Fast & Furious 7? Or an indication of ructions behind the scenes? An official answer hasn't been forthcoming and isn't likely to emerge soon. What it does indicate is yet another troubled chapter in the turbulent musical history of the Marvel movies, which have chopped and changed composers as many times as Tony Stark has enjoyed lavish, 12 course dinners. Yet whatever the reasons behind its troubled birth, the resulting soundtrack is genuinely entertaining. Broadly speaking, Tyler gets the bulk of the action cues whilst Elfman gets the more memorable thematic material, constructing a whole new Avengers hybrid theme that has Silvestri's music as its basis. The swirling "Avengers: Age of Ultron title" establishes the familiar choppy Tyler string ostinatos, building into a furious, if brief, assault from the brass section before Elfman's first contribution asserts itself in the terrific "Heroes". It's the first statement of Elfman's new theme from the movie, chugging along with verve and vigour on a bed of punchy brass fanfares, anvil strikes and general patriotic fervour. 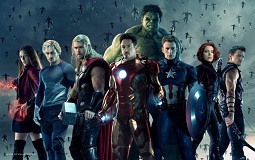 Silvestri's four note theme from Avengers Assemble subtly underpins the music, adding franchise continuity whilst at the same time Elfman takes the future of the Avengers in new musical directions. Tyler's chorally enhanced "Rise Together" brings back welcome memories of his previous Marvel scores, striking a note that is both contemporary yet pleasingly nostalgic with its trilling, John Williams-esque woodwind arrangements and full-blown sense of bombast. "Breaking and Entering" is the first piece of fully-fledged action music, a full-throttle assault from the orchestra with surging strings, thunderous timpani and heroic brass, stylistics that carry over into the bulk of Tyler's cues including the relentless "Hulkbuster" and the percussion-laden "Seoul Searching". However, Tyler's work isn't all action. 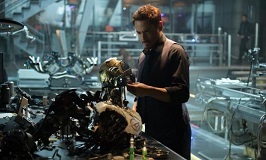 "Birth of Ultron" introduces a new theme for the film's eponymous baddie, a piece that cleverly starts out with a subtle interpretation of the composer's own Iron Man 3 theme, cleverly hinting at Stark's involvement in Ultron's creation. The piece then changes tack and becomes darker as the character's true intentions are revealed. Later on, both "The Vault" and "The Mission" re-introduce the varied and dynamic percussion alongside performances of the Ultron theme, beefing up the sense of threat the diabolical A.I. poses. There's also a theme for The Vision, an ethereal and wondrous track that's also enjoyably ambiguous, refusing to spell out whether Bettany's character is on the side of good or the bad. 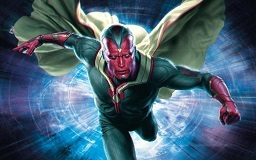 The Vision's theme gets a rapturous statement at the start of later track "Fighting Back", completing the character's move to the side of the good guys before more relentless action music takes over. There's also a tender love theme for Hulk and Black Widow: given that she's the only one who can talk the green guy down, their relationship becomes central to the film, and Tyler capitalises on this in tracks "Breaking and Entering", "Wish You Were Here" and "Sacrifice". Even so, it's more often Elfman's terrifically rambunctious Avengers theme that grabs the attention, with "It Begins" recalling the rhythmic heights of his groundbreaking 1989 Batman score. 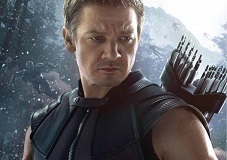 The theme is also malleable, as evidenced by its homely, guitar-led variation in "Farmhouse" and "The Farm", accompanying one of the film's key sequences where the Avengers decamp to Hawkeye's abode. Sitting alongside this are more textural moments such as the Eastern European-influenced "Ultron-Twins", which is designed to capture the murky allegiances of orphaned superhero siblings Scarlet Witch and Quicksilver. The track also serves a clever dual function, the moodily attractive cello/choral injection hinting at the background of Black Widow as seen via the vision sequences induced by Scarlet Witch. 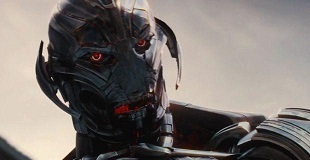 "Ultron Wakes" features prominent electronics and synth samples that almost sound like whale song, although the Avengers theme is present in a subdued arrangement to keep things anchored. Meanwhile, the thunderously exciting "Can You Stop This Thing?" is a reminder that Elfman is as good as Tyler when it comes to the action stuff. Complementing this already overwhelming plethora of ideas are the themes from earlier Marvel movies. Tyler references his Iron Man 3 theme briefly in "Hulkbuster" (where it gets a dynamic accompaniment from a host of tribal drums) and also his Thor: The Dark World theme in "The Battle" and "Outlook". Strangely, it's Alan Silvestri's own Captain America and Avengers themes that seem to get sidelined in Tyler's cues. Perhaps he recognised that Silvestri was already well-served by Elfman's contributions. However, the outburst of Silvestri's "Helicarrier" Avengers cue towards the end of Tyler track "Outlook" is air-punchingly exciting, unashamedly heroic in nature. Elfman's very own theme from Ang Lee's 2003 movie Hulk even manages to sneak into the "Farmhouse" track, a welcome surprise given its status as a relatively underrated superhero score (being attached to a critically derided movie clearly didn't help). And just to complicate things even further, Elfman quotes Tyler's Iron Man and Ultron themes in "Inevitability-One Good Eye", which builds a portentous sense of impending danger through rhythmically imposing brass, snares and soaring choir. The xylophone strikes and thrilling brass patterns could also be seen as a subtle allusion to Silvestri's musical style, even when his musical ideas aren't being directly referenced. It's genuinely impressive, adrenaline-pumping stuff, the sort that the best superhero scores are made of. As the film moves towards its climactic battle, Tyler and Elfman begin to bring their disparate musical ideas together for one final blowout. There are more rambunctious Silvestri-isms in Elfman's enjoyably defiant "Avengers Unite" which adds a soaring choir for added dynamism. "Keys to the Past" builds a sense of anticipation with a brooding, string-laden variation on Ultron's theme, underpinned by rumbling piano chords and bells. Tyler then pulls out all the stops in "Uprising", again demonstrating his flair for powerfully rhythmic action music that ebbs and flows with genuine purpose. It never descends into aimless noise and there's even asense that he's feeding off Elfman's influence in parts, especially in the brassy signatures. The ballsy inclusion of Silvestri's Captain America theme then leads into the surgingly dramatic "Outlook", whose unexpected cimbalom element is presumably meant as a signifier of Black Widow's character. The Hulk/Black Widow love theme then gets a poignant airing in "The Last One", the ideal comedown after such an onslaught of action and a reminder of the inter-personal relationships at the heart of the chaos. 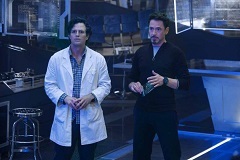 It's then back to Elfman with the subdued, thoughtful "Nothing Lasts Forever" as the Avengers contemplate their future as a unit; contained within is a sly reference to Tyler's Iron Man 3 theme, reminding us of Stark's central role in the Ultron crisis whilst anticipating the darker turn his character is set to take in Captain America: Civil War. The enormously enjoyable "New Avengers- Avengers Age of Ultron" then caps everything off in style with a spectacularly rousing reprise of Elfman's new theme, here embellished with an ever more prominent choral accompaniment. It's a gloriously old-fashioned reminder of the power of the superhero score and alludes to a whole new future for the Avengers. The track's rollicking nature is also a potent reminder of Elfman's Batman and Spider-Man scores, works that helped secure him as one of the pre-eminent superhero composers of the modern age. Listening to Avengers: Age of Ultron outside of the context of the movie it was written for reveals the score to be quite a pleasant surprise, one crammed full of intelligent new ideas, vibrant action music and subtle allusions to past Marvel soundtracks. Very little of this comes across in the film itself: either the music was edited badly or mixed far too low in the sound design but the score as heard in the movie is never as arresting as it perhaps should be. However, several listens to the score in isolation unveil myriad pleasures, whether it's Elfman's late-flowering new theme for the Avengers themselves or Tyler's expert straddling of Golden Age and 21st century music sensibilities. What's even more impressive is that the score manages to cohere in spite of its difficult birth. Whatever the circumstances that led to Tyler and Elfman working on the same project, their styles complement each other very well, even if it's the latter's contributions that are ultimately more memorable. And whilst it's great to see the powers-that-be are still utilising Tyler's services, it's even more heartening to be reminded that Elfman still has sufficient welly in the action music department: it's never a bad thing when a 21st century action score calls to mind his majestic, trend-setting work on Batman. And finally, given that Age of Ultron is the first time a Marvel score has explicitly used a previous soundtrack as a thematic basis, fingers crossed this will mark a turning point in the series and that future soundtracks will make more effective use of what's come before. 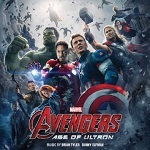 The soundtrack album for "Avengers: Age of Ultron" is available in CD and MP3 formats from Amazon.com and Amazon.co.uk.